At Starkwood Chiropractic, our expert chiropractors can help relieve the pain you feel in your neck and back in as little as one visit to our office. Through the use of spinal adjustments, soft tissue treatment or one of our other physical modalities, we’ll have you feeling better in no time. Starkwood specializes in chiropractic care for auto accident injury, workplace injury, and sports injury. Our approach is diverse, offering a care solution for every individual. At Starkwood Chiropractic, we specialize in therapy methods that aid in the recovery from car accident injuries. Our evidence-based approach focuses on reducing pain & inflammation and increasing mobility. Each treatment is personalized to the individual and the trauma that caused the current state of pain & discomfort. We work with your other medical practitioners to ensure that your chiropractic treatment is as effective as possible. Work-related injuries can vary greatly from situation to situation. That’s why it’s important for us to take extra care in learning about your medical history, the incident that caused your injury, and where your pain & stiffness has localized. We then create a plan of action to relieve pain, reduce swelling, and increase mobility in your joints. No two injuries are the same so it’s important to have a customized care solution. Sports injuries often vary from other types of injuries because they more commonly occur in the knees, hips, ankles, shoulders, and arms. These joints are used all the time in everyday life which means a sports injury could have lasting negative consequences. Our Gresham area chiropractic clinic is equipped with the best state of the art equipment for identifying sports-related injuries and assisting in a speedy recovery. We offer a number of therapeutic chiropractic services at our Gresham chiropractic clinic. We specialize in the treatment of auto accident injuries and other painful injuries. An auto accident can throw your spine out of whack and cause you a tremendous amount of pain that doesn’t go away over time. With one of our spinal adjustments, we can manipulate your vertebral joints back into their natural positions. This will relieve the pressure on your nerves and muscles, and will greatly diminish your back or neck pain. Our soft tissue therapy can help to remove unwanted scar tissue that has formed as the result of some kind of physical trauma. This can restore your full range of motion and help relieve your pain. Unlike other Gresham chiropractors, we are experts on nutrition and proper diet. We provide dietary and nutrition counseling to help you eat right and get plenty of nutrition. We even can make recommendations for certain exercises and stretches that can be therapeutic and beneficial for your bones and muscles. We can help make your recovery from injury a convenient and comfortable ride. If you suffer from constant back pain, neck pain or headaches, then you can benefit from our chiropractic care. Our office is located about 15 minutes from the heart of Gresham and is easily accessible from both I-84 and I-205. If you’re coming from Gresham, the quickest route to our clinic is by taking Stark Street, we’re right between 112th and 111th, you can’t miss us! Contact us today if you have any questions or if you’d like to schedule an appointment. When looking for chiropractors in Gresham, keep us in mind. Although we are located in Portland our office is very near to Gresham and is easily accessible. We hope you found this information to be helpful and insightful. If you are looking for a Gresham Chiropractor, we are a great choice. 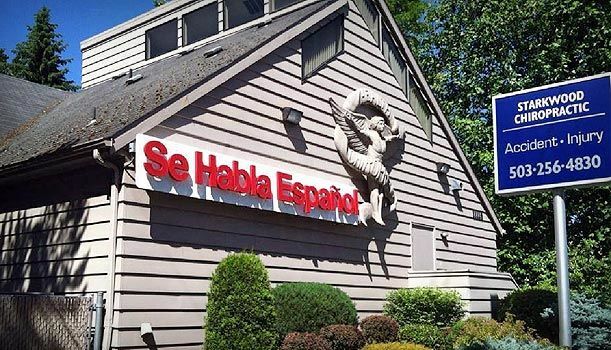 Located in Portland just off I-205 near Gresham, our offices are easy to find and most of our staff is fluent in Spanish if needed. Thanks for choosing Starkwood Chiropractic.